With a whopping 2.23 billion people logging onto Facebook every month, there’s little question that members of your target audience are among the social network’s many users. For this reason, creating a Facebook business page, the anchor for your brand’s presence on Facebook, is probably a no brainer and something you’ve already taken care of. 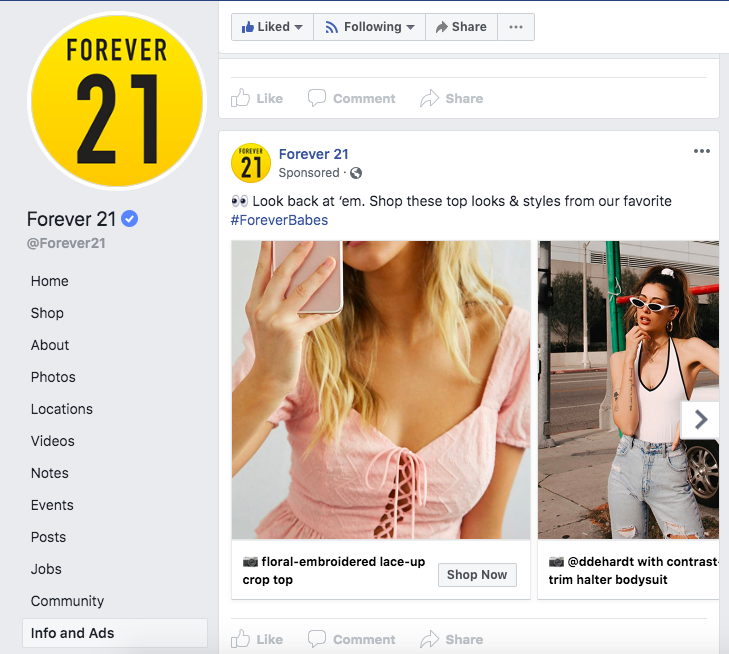 But many multi-location brands stop short of creating and managing pages for every store location, thinking that one corporate page is enough. In this guide, we’ll outline several reasons why it’s critical to your local marketing success that every one of your stores has its own well optimized Facebook business page. Luckily, Facebook makes convenient tools available for this purpose. Your corporate page can act as a “parent” to numerous “child” pages, one for each of your store’s locations, and this can make it fairly straightforward to monitor and update a large number of pages. Of course, making updates at scale, responding to reviews, and syncing your Facebook data with listings on other sites can be much easier with a partner like Brandify. But first it’s important to understand why Facebook business pages matter for multi-location brands. It will probably not surprise you to learn that Facebook is one of the most heavily indexed sites on the planet. This basically means that Google looks at Facebook content as a primary source for results to search engine queries. In fact, the importance of Facebook is especially clear when you look closely at search results for local businesses. Take, for example, this search for a Target location in Paso Robles, CA. 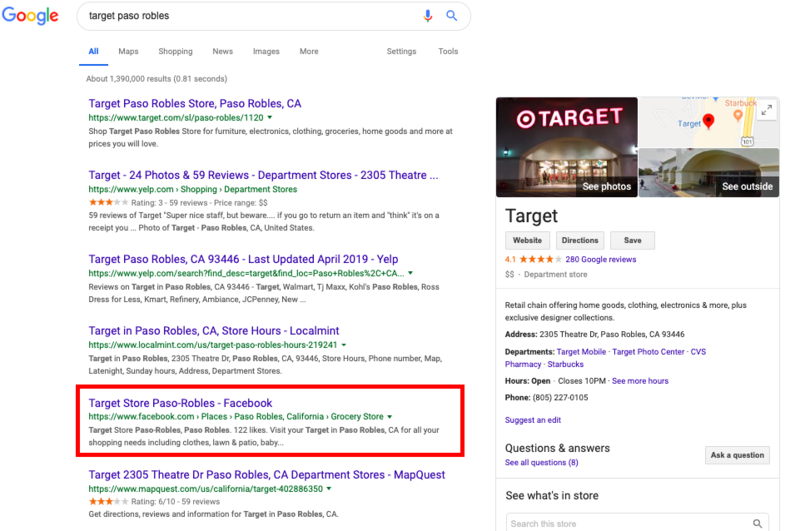 Note the prominence of the store’s Facebook page in local results that also include the Target website, Yelp, and other local sites. Aside from the traffic to Facebook generated via Google search results, the evidence that Google is indexing Facebook content for local searches points to the importance of Facebook as a local signal from Google’s perspective. Google looks across multiple local websites to verify the existence of local businesses and to gauge their popularity and relevance for specific search terms. For these reasons, creating optimized Facebook pages for each of your stores is a powerful strategy in your local marketing arsenal. 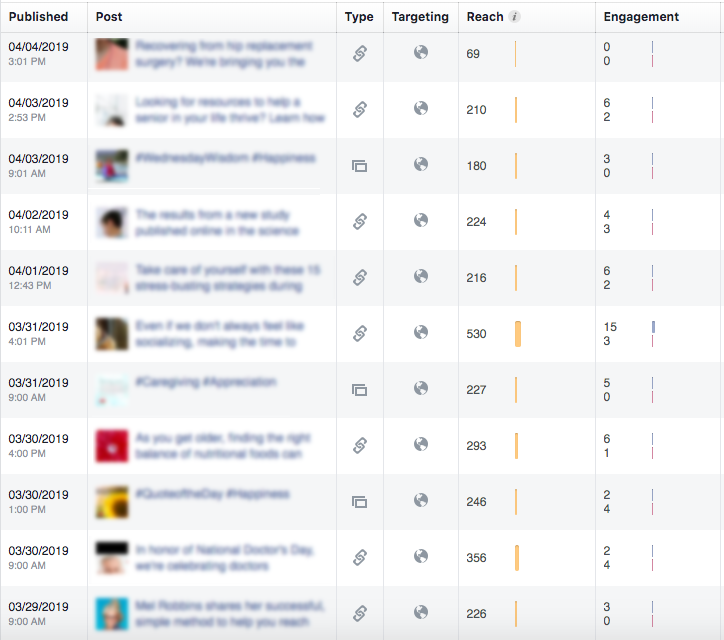 This is not to mention, of course, the direct traffic Facebook store pages generate when users search for local content on Facebook or see recommendations from friends, posts from business pages, and ads. Facebook has one of the best analytics suites of any social media channel, and best of all, you can log in and view your analytics on Facebook at no charge! 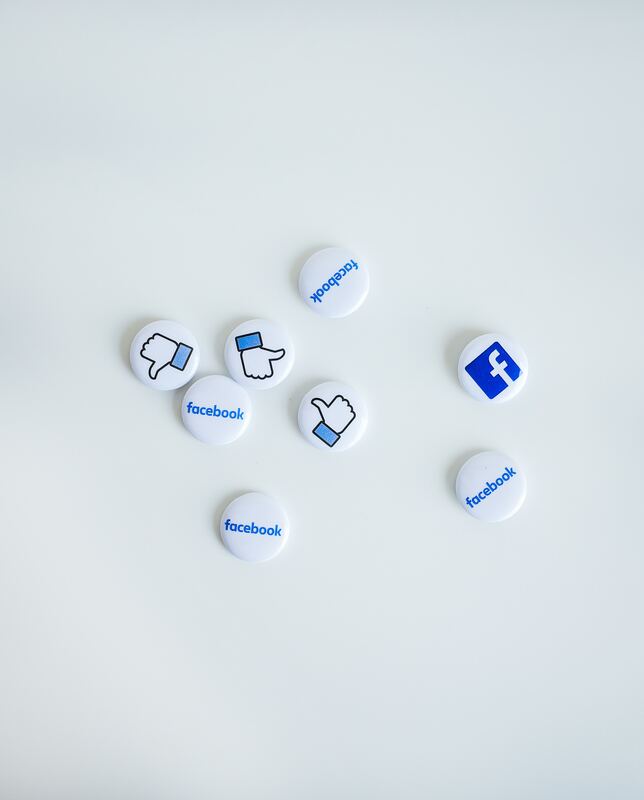 When you create a Facebook business page, you’ll be able to utilize the detailed analytics Facebook offers to optimize your social media strategy and get to know your audience better. 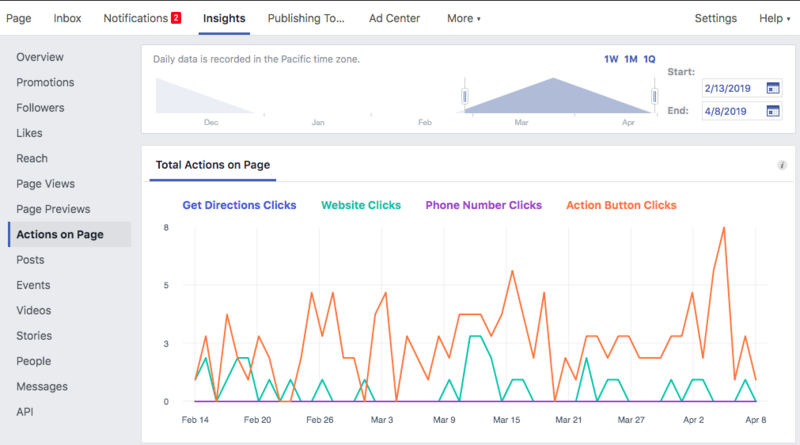 To access Facebook analytics, go to any of your pages and view the “Insights” tab. “Posts” on the left-hand side of the Insights tab. In addition, you can see how many actions your followers have taken on your page by clicking “Actions” on the left-hand side. If you’re an enterprise brand, the thought of managing Facebook pages for hundreds of locations may be daunting. But, did you know that you can create a post on your parent page and automatically re-post the same content to all of your store pages? In Facebook terms, this is another way of saying that child pages can inherit posts from parent pages. Syndicating your content to all store pages helps to ensure that each page is active and filled with new content frequently. This top-down publication model helps with oversight as well. Staff at your corporate office is also able to control the content that is published, which ensures content is consistent and on-brand. 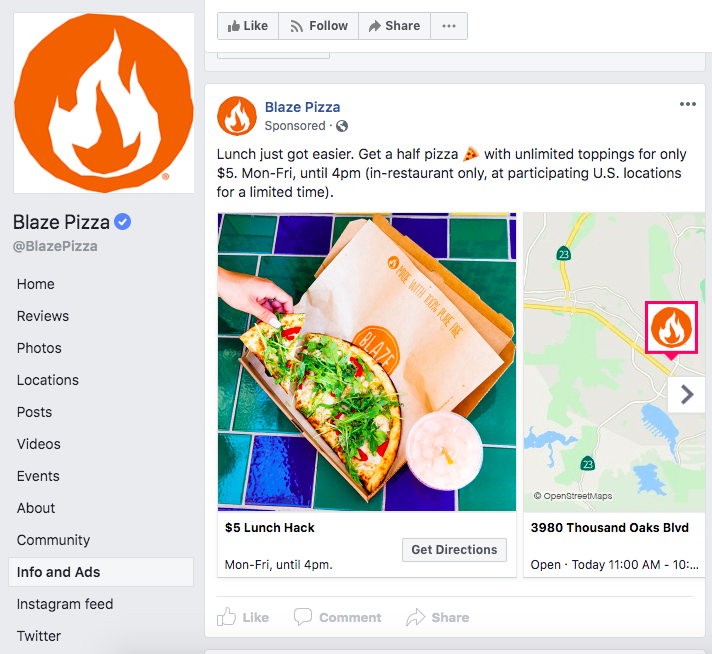 This strategy works whether or not franchisees or location managers are posting independently on individual store pages. We recommend only publishing content that is evergreen and applicable to most locations. For example, we would not recommend posting location specific fundraiser on the parent page to push out to other locations. 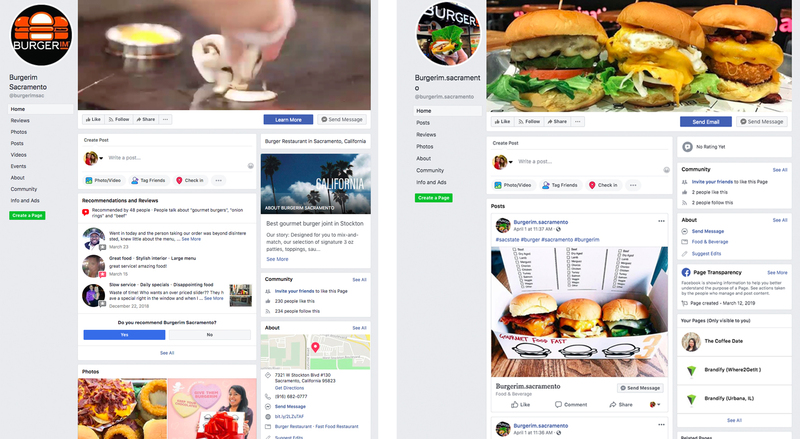 Not only do Facebook business pages enable chains and franchisees to generate unique content on their pages, they also give the corporate office the ability to grant different access levels to location owners or managers, making it easy to approve and manage local content. By posting location-specific content, each location is able to speak to their local customers and form a bigger connection with their community. Struggling with what to post on your local Facebook page? 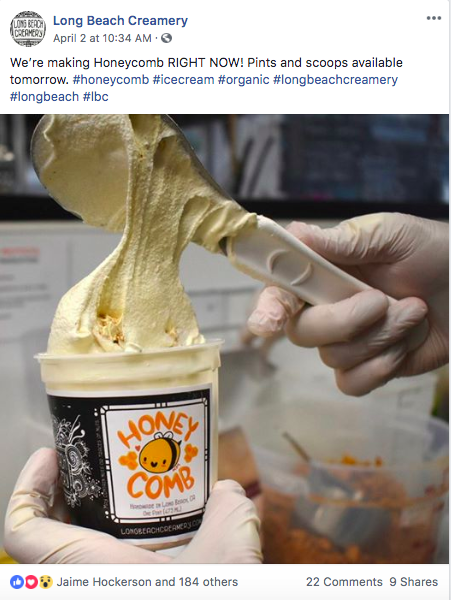 Long Beach Creamery uses Facebook to post updates about their freshly made ice-cream flavors. 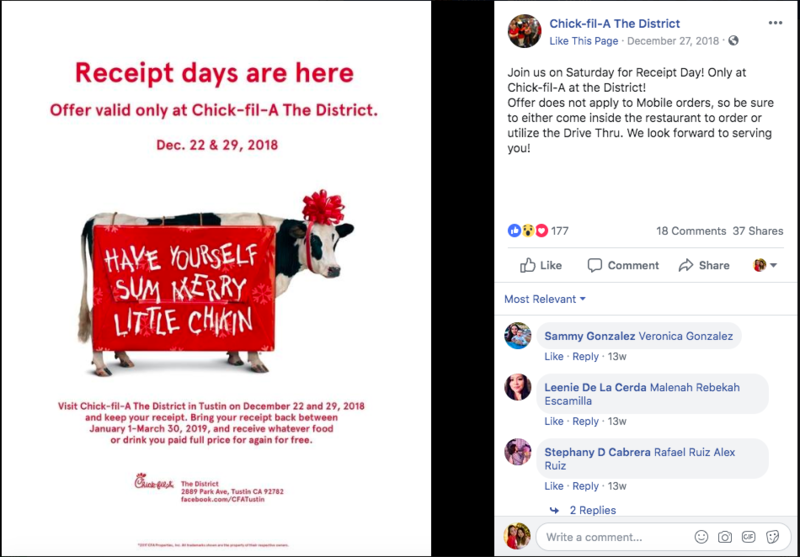 Chick-Fil-A The District used Facebook to promote their location specific “Receipt days” which were a hit with local communities. By utilizing Facebook Tabs, you’ll be able to steer your target audience in the direction you want. Facebook provides you with standard tabs such as About, Events, and Photos, but you can also create your own Facebook Tabs. 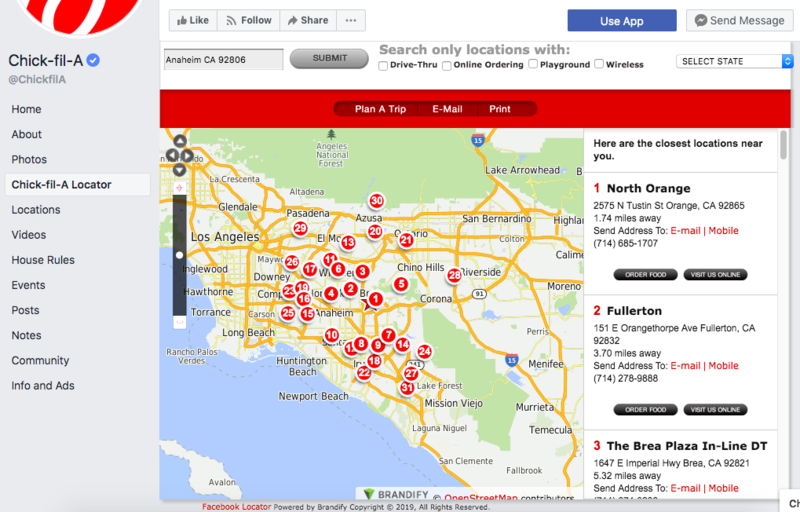 Chick-Fil-A uses the Locator tab to make it easy for Facebook users to find their closest location. 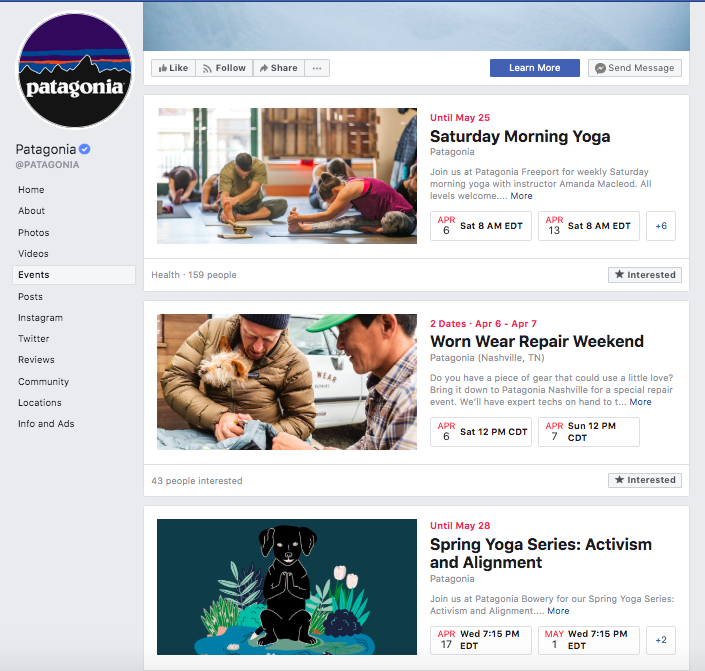 Patagonia created an Events tab to promote in-store events and increase customer engagement, activities which can lead to improved customer retention. Lucky Brand created a Rewards tab to promote their store loyalty program. Users are greeted with a pop-up window encouraging them to sign up for the Lucky email list. Best Buy utilized a “Question & Answers” tab as a way to answer and get feedback from their customers. It’s a genius move because it’s also a way for customers to leave feedback (without them posting it on Yelp or leaving public comments on their social posts). 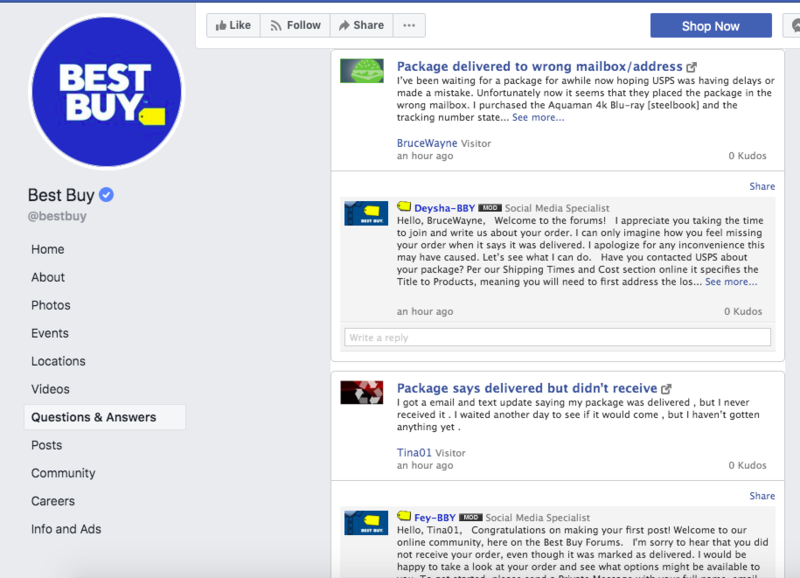 Best Buy can, then, reply back to the feedback and offer support. Facebook business pages also allow you to craft better customer experiences by giving you the ability to respond to reviews and manage your reputation. You can grant users at specific access levels -- for example, chain or franchise managers, regional managers, or corporate-level users -- the permission to respond to reviews. 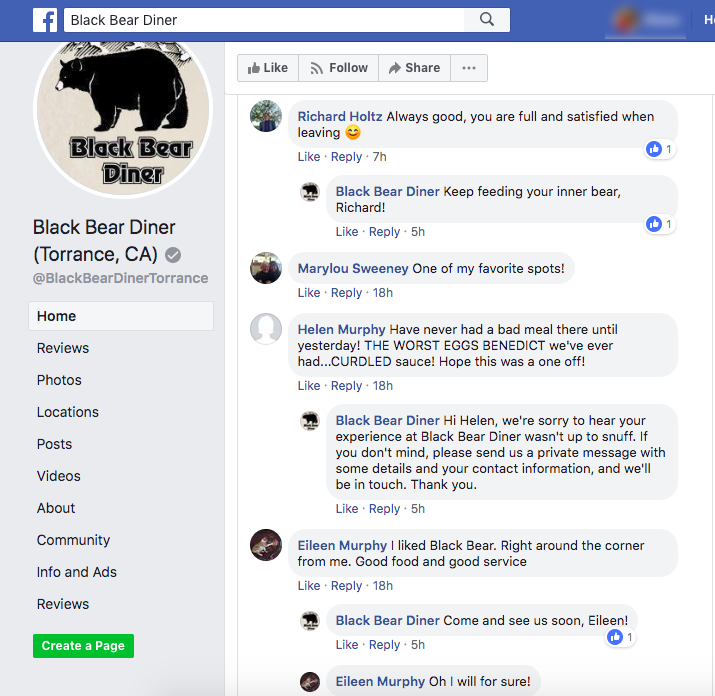 Black Bear Diner in Torrance, CA does a good job of monitoring their social media channels and responds to reviews in a timely manner. Not only do their responses inject a little bit of their brand personality, but they respond to both negative and positive reviews. We like how they invite the user to send them a private message as a way to move the conversation “offline”. Don’t know the best way to respond to a negative review? Download the Brandify Review Response Guide! Once you have a Facebook business page, running ads for specific locations will be a breeze. No longer do you have to run one general ad; now you can target ad copy to reflect your target demographic, call out a specific location, and even add in location-specific pricing. Did you know that you can place an ad around a location’s address? For example, you can set your ad to target those within 10 miles who are in the area or who live in the area. 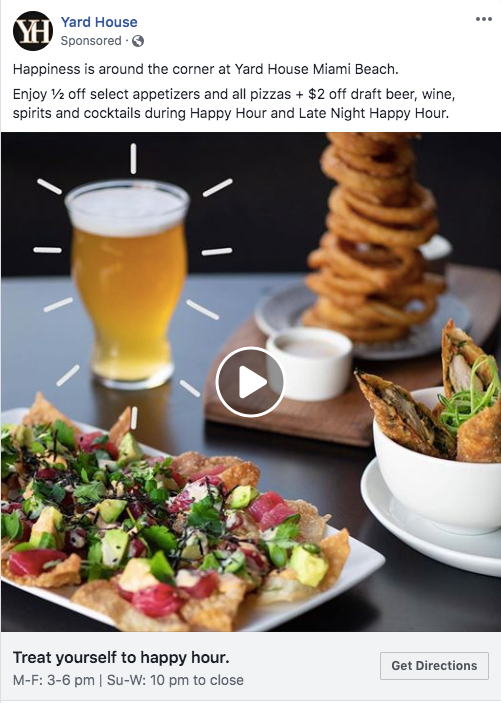 If you’re a restaurant who wants to run ads promoting your lunch special, you’ll want to target those who are currently in the area (to capture those who work nearby). Facebook introduced the feature “Info and Ads” in an effort to become more transparent to consumers amidst privacy concerns. The new feature provides businesses with the perfect outlet to research their competitors and find out what ads they’re running. Please note that the Info and Ads feature may not be viewable depending on whether or not the business has run Facebook ads in the past. • What type of ad is your competitor running? Are they focusing on video ads, carousels, or just regular image ads? • What ideas can you gather from their copy? Does it identify and solve a problem that would resonate with your target market? • Measure your engagement rate against competitors’ posts. How do they respond to comments? How does your engagement stack up compared to them? Blaze Pizza uses carousel ads with eye-catching images to capture their audience's attention. They also include a location pin in their ad, making it easy for their customers to know where the closest location is. Forever 21 uses a carousel ad as well. They also make sure to use copy that will resonate with their audience and adds in the hashtag #ForeverBabes. Another important thing to note is that they are using user-generated content (UGC) as seen on the image on the right, which tags the original poster. Claiming your Facebook business pages ensures that your name, address, and phone number (NAP) are correct and your business does not have any duplicate listings. Leaving duplicate listings or incorrect information in publication puts your brand at risk of confusing potential clients and missing out on accumulating recommendations or engagement. What’s more, if you haven’t claimed your location pages or detected all duplicates, you may be missing negative reviews of your business that will impact consumer buying decisions. The example below illustrates what happens when a brand has two Facebook pages for the same location. 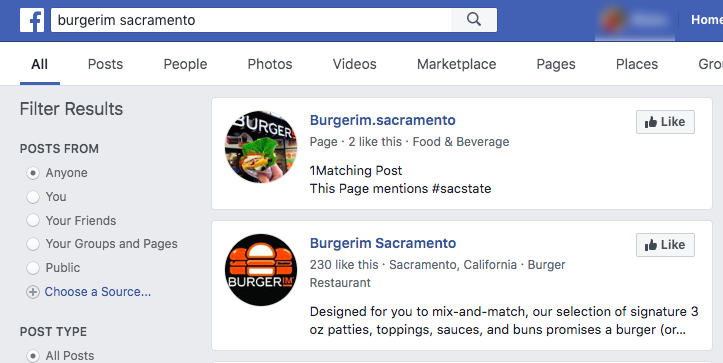 A search for “Burgerim Sacramento” shows two Facebook pages in the result. One of which only has 2 likes, while the other has 230 likes. When viewed side-by-side, it becomes more apparent which one is the main page and which one is the unofficial one. But to the average consumer, the existence of two pages is confusing, and since the unofficial page turns up before the official page, consumers may be more likely to click on the first result and believe the unofficial page is the one that best represents the business. These are just a few of the most important aspects of Facebook business pages for multi-location brands. If you’re looking for help managing your Facebook business pages, look no further! Brandify can help you manage, optimize and deduplicate Facebook pages at scale while providing real-time updates. Did we mention that you can manage your reputation too?